Move files between your computer and your customer's within a secure connection. 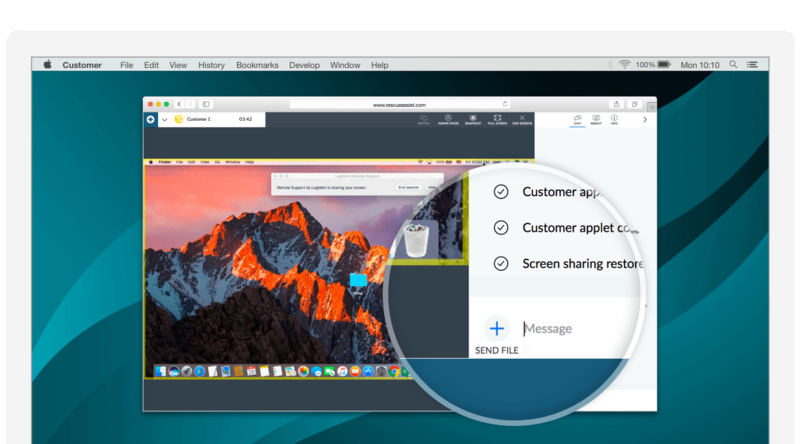 A secure, easy way to transfer files. When you want to give a customer a file to complete a fix, you don't need to bother with thumb drives, FTP, or cloud-based storage services. RescueAssist uses the same firewall and proxy-friendly connection that it uses for screen sharing to enable its file transfer feature, so there are no restrictions on the type or size of the live session file transfer. Transfer files in live or unattended sessions. 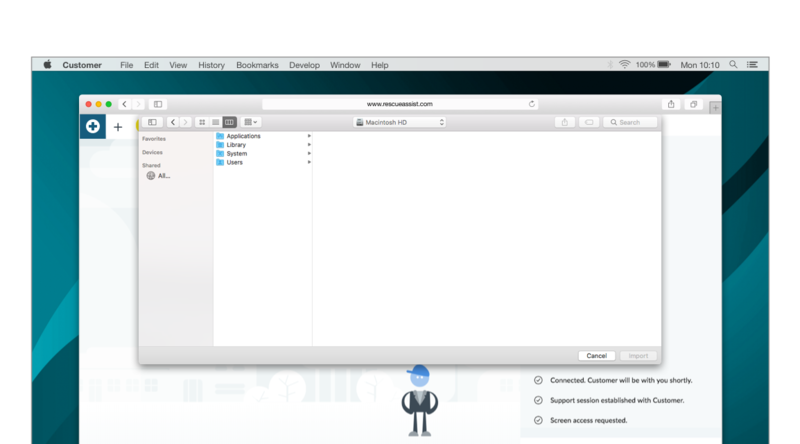 When you're in a live session with a customer, you can quickly select files from your computer to send or drag and drop onto their screen. Alternatively, you can ask for a file from their system. Either way, RescueAssist will prompt the customer for permission. Transferring files also works in unattended sessions and in web chats on your Support Center. File Transfer to the rescue. RescueAssist makes it easy for customers to receive large or critical files when they need them most. If malware or malfunctions are preventing work from getting done, you can send a patch, update package or file replacement directly to their system. And transfers move quickly, so your customer can get back up and running in no time. Control who can transfer files. Security is essential when extending remote support privileges to your team. To ensure that your customers’ systems are never mishandled, you can easily adjust permission settings for the file transfer feature. That way, you control who can send or receive files while in a support session. Maintain your customers’ trust without worry. Learn more about RescueAssist features. Access and control end users' computer to resolve issues quickly. Set up new technicians and customize permissions.